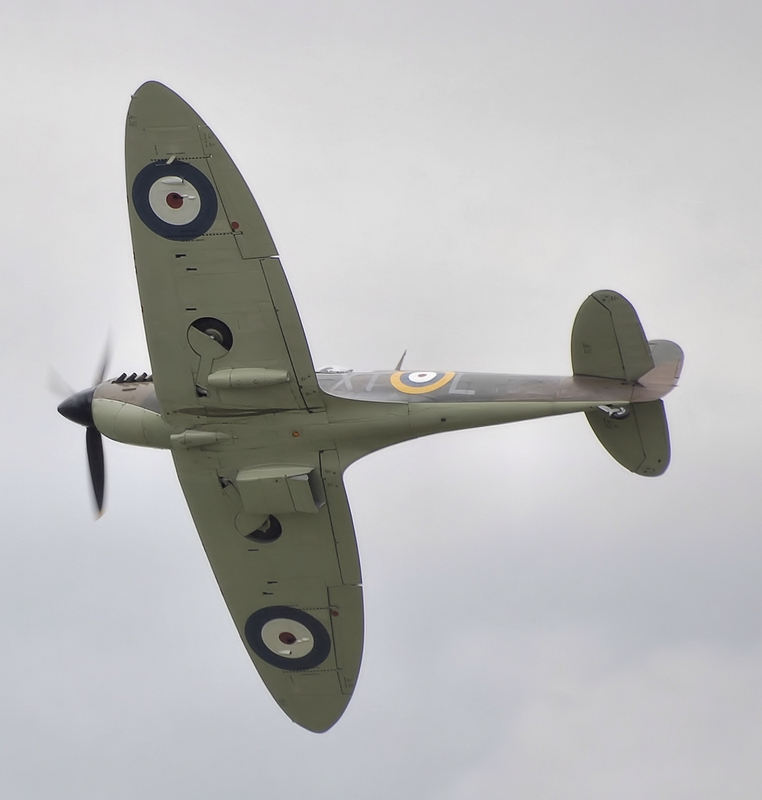 This entry was posted on June 27, 2009 at 2:13 pm and is filed under Bute Park with tags Battle of Britain, Bute Park, Spitfire, William Walton. You can follow any responses to this entry through the RSS 2.0 feed. You can leave a response, or trackback from your own site. This is indeed *the* famous scene from that film, and deservedly so. I never forgot it from 1968 onwards, when my parents took me to see it on initial release. Music makes an enormous difference to the emotional impact of a scene – how many people would regard the opening of 2001 as a standout without the Zarathustra score? It is true that all serviceable fighter planes in the southeast (“11 Group”) were aloft to repulse the September 15th raid. But by then the Germans had made the decisive mistake of switching from bombing airfields to towns. Had they continued to try to throttle the RAF on the ground the outcome might have been different. It is indeed striking that the heroes of the Battle of Britain were barely past being children. And this isn’t the only example: when I read the history of the Manhattan project, I’m astonished to see how young the main participants were. Bethe was considered an old man for being in his 30s. The same thought applies to the people who made Apollo work: in general, they were 20-somethings who just made it up as they went along. I suppose they would have been worried at the lack of precedent for what they were doing had they been older. It’s hard not to contrast this innovative success with the present state of NASA now it’s a mature organisation stuffed with highly experienced 50-somethings (and I write as a 50-something myself, sigh….). One can extend this argument to cosmology. When you look back to the revolutionary developments of the early 1980s, a great deal of the work was done by people who were rather junior. I presume this reflects the fact that experience is less help when the foundations of science shift in a radical manner (although this didn’t hold back Peebles or Zeldovich). Of course, all these bright young things of 1980 are now 50-somethings: I hope cosmology isn’t going the way of NASA…. Walton’s music for the Battle of Britain was actually rejected by the producers and Ron Goodwin was engaged to write a replacement. I believe that Sir Laurence Olivier (who played Dowding in the film) was so outraged at the decision that he persuaded them to keep at least some of it. Most of the music used is actually Goodwin’s, but at least they kept “Battle in the Air” which accompanies that sequence. I think it’s wonderful music. As for 2001, it’s not just the piece by Richard Strauss (used a lot in the TV coverage of the Apollo missions) that is memorable. The use of the Blue Danube (by another Strauss) is also very effective, for reasons that I don’t really understand because it seems on the face of it such a very incongruous accompaniment to spacecraft! I often get quite emotional thinking about conflicts such as World War II. It’s not just the horror and suffering they involve, but because I know that I wouldn’t have had the courage myself to do what people like those pilots did. I think you’re right in implying that it’s lack of fear – whether of death or just of failure – that leads younger people to do extraordinary things. Yes, war is great at bringing young talent on – a point emphasised by the modern historian Christopher Andrew. Too bad we don’t do it in peacetime. WW2 makes me emotional too, because of the best that it brought out in so many people, and because I think the generation that fought must look around today and feel that the freedom they fought for has been taken for granted. Ron Goodwin did a superlative job with Where Eagles Dare and I presume that the “main” theme of Battle of Britain is his. But I am very glad that Walton’s “Battle in the Air” made it to the soundtrack. Re 2001 – totally agree that the Blue Danube is another standout sequence; I call it the waltz of the spacecraft. Later in the film, Khachaturian’s Gayaneh Ballet Suite captures the cold remoteness of space far from earth very well too. Kubrick originally had these (and Zarathustra) as working music and intended Ligeti (who wrote the ‘weird’ music in it) to do the whole score. But he was persuaded that those pieces were perfect. I’d like to know whether he used Zarathustra because the BBC did for its Apollo coverage, or vice-versa. I experienced a slightly similar experience to your Spitfire fly past in June of last year. A number of large aircraft flew over, followed by a group of 16 fighter jets in a 4 X 4 formation. It seemed almost as though war had broken out, until I realised that it was the Queen’s birthday and the planes were heading to a fly past at Buckingham Palace. On the subject of Sir William Walton and film music for Spitfires, we should remember that Walton wrote the music for The First of the Few, the biopic of R. J. Mitchell, the designer of the Spitfire. Walton subsequently rearranged some parts of the film music for use in the concert hall as the Spitfire Prelude and Fugue. We might also remember that Britain was not quite alone in the months after June 1940. The countries of the British commonwealth fought alongside Britain, as did many servicemen from the occupied countries of the continent. Indeed, Polish air force pilots feature in the film The Battle of Britain, if I remember correctly. Thanks. I’ll definitely investigate more of Walton’s music. I have the music he wrote for Olivier’s Henry V and also the piece called Facade which was a collaboration with Edith Sitwell, but other than that don’t know very much about his work. He was an American who joined the Royal Canadian Airforce and served during the Battle of Britain. He died in a mid-air collision over Lincolnshire in 1941. I think the phrase “done a thousand things you have not dreamed of” says it all about my admiration for all those men. I knew of the words of the poem and that they were written by an American, but did not know that they were written by somebody who had fought and died in the Canadian air force before the United States entered the War. I recall some lines being quoted by Ronald Reagan after the Challenger Space Shuttle disaster. Walton did write a lot of good music. Facade was clearly written with his tongue in his cheek with an intention of upsetting musical traditionalists: it’s a big comical send up of lots of things. The score to the film Henry V (another war-time propaganda cinema work) is excellent. But among Walton’s other works, Belshazzar’s Feast is a large-scale choral piece that is still popular; I heard a nice performance in St David’s Hall about ten years ago. ‘Also Sprach Zarathustra’ was used in ‘2001’ before the BBC (and, I think, other broadcasters) used it for their coverage of the Apollo missions. There are also vaguely conflicting stories about the existing classical pieces for ‘2001’ being only place-holders for some “custom-written” music by someone with a name like Chris North. This music was subsequently released, but thankfully Kubrick trusted his instincts (and the fact that, in his approximate words, “current composers are good, but there are not Mozarts or Beehovens”). On a different tack, my father (who flew fighters in Australia in WWII, but didn’t see active service) would absolutely agree with the statement about the lack of formalised tactics in such dogfights. His take is that almost any statements about organisation in war are somewhere between huge exaggeration and complete nonsense. Kubrick originally intended Gyoergi Ligeti to write the whole 2001 score, and did indeed have Zarathustra, Blue Danube and Gayaneh as placeholders (see my comment above), but people persuaded him – rightly! – that these were perfect. Ligeti ended up writing only the ‘weird’ music in 2001. This story is in more than one Kubrick biography I have read. I thought of writing one myself at one stage. 2001 was released in April 1968. Apollo 8, which was the first Apollo spacecraft to break new ground by going beyond earth’s orbit, and orbit the moon, lifted off in December that year. So I guess you are right that the BBC got it from Kubrick. I remember it well on their coverage, although I didn’t see 2001 for another decade.